If your CRM tool is not able to connect to the applications that need the CRM data, you’re likely not getting the best performance possible out of your CRM tool. With a CRM integration tool, you can rapidly connect to more than 200 applications, providing a cloud-native environment to quickly build, deploy, and manage any-to-any integrations. 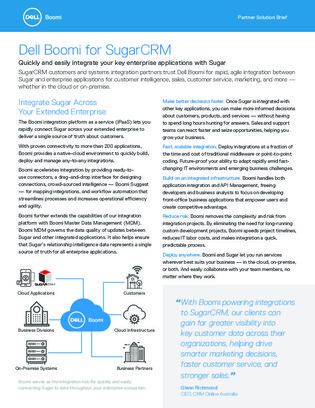 Open this whitepaper to learn about a CRM integration tool with ready-to-use connectors, a drag-and-drop interface for designing connections, and workflow automation that streamlines processes and increases operational efficiency and agility.